Some say the original is by Mahawa Kouyaté, but I think it's a traditional. Balla et ses Balladins have a version, but it hasn't been included on the (nevertheless) brilliant collection from Stern's. And that's the only version on the Syliphone label. A quick search on the web reveals a rap version (using the version by Morydjeli Deen Kouyaté*), a version categorized under Papua New Guinea and a few more. 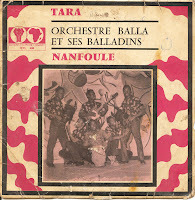 Here are two more versions: the first is by the Simandou Jazz de Beyla (broadcasted on April 3, 1986 by the RTG), the second is a superb instrumental version by the Horoya Band. It's from a cassette attributed to the 'Horiya Band', which appears to be an attempt by a few of Horoya's musicians to survive in the post-Syliphone era. It's one of my favorite non-Syliphone cassettes from Guinea, - so I have included the whole cassette. I think you're right, it's a traditional tune? 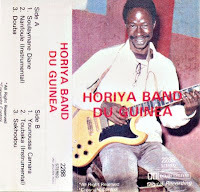 I like this Horiya Band du guinea tape. Do you know the release year? I'm afraid I don't hear the resemblance between N'Toman and Nanfoule. Ethnomusicologist Eric Charry -by the way- writes that Nanfoule is a song protesting French colonial rule. As to the release year of the cassette: it was bought in 1986. It's quite the same melody, isn't it? thanks for this, even without their fantastic horns, the horoya cassette is very nice. this work of Horoya is fantastic! Do you actually have the Balladins' Nanfoule 45? I would love to add it to the Balladins @ 45 Tours collection I posted awhile back. Any possibility of a post?